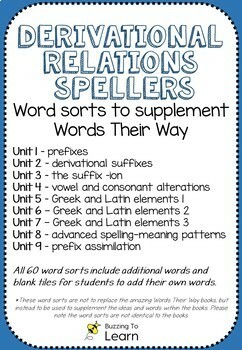 Word sorts to supplement Words Their Way- Derivational Relations Spellers book. Contains all 60 word sorts! 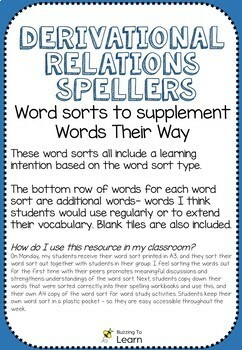 * please note: the word sorts are not identical to the books as they are meant to supplement the program. 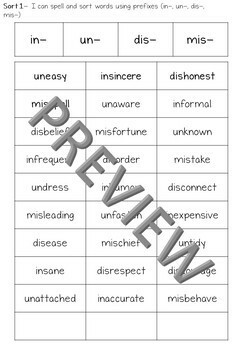 I have included additional words for every word sort and blank tiles for students to add their own words. Suitable for Words Their Way second edition (2009). 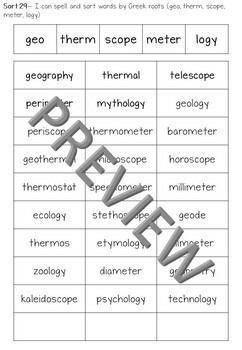 *These word sorts are not to replace the amazing Words Their Way books, but instead to be used to supplement the ideas and words within the books. Please note the word sorts are not identical to the books. I hope these save you time! Thank you for purchasing!